Srixon has two new versions of the Z-Star out on the market for 2013. The first is the Z-Star, which I reviewed last week. The 2nd is the Z-Star XV, a model built for players with higher swing speeds. I’d tried a previous model Z-Star XV but it was too hard for my slower swing speed. I gave the 2013 model a shot, pun intended, and could certainly tell a difference. I could play the ball given optimal conditions. Let’s take a look at the 2013 Z-Star XV. The Z-Star XV is a “tour” level golf ball. This means the performance is best for professional golfers or amateur golfers who demand high spin in the short game and short irons. 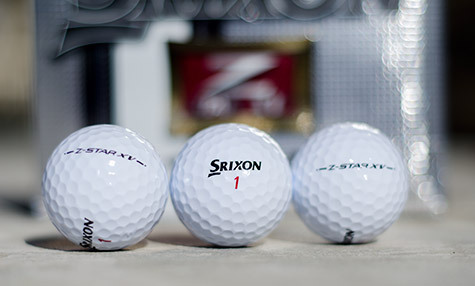 The Srixon Z-Star XV is a four layer ball: two cores, a mid layer and the cover. The XV is high compression ball designed for players with a higher than average swing speeds. Inside the center of the ball, the dual core produces the power of the ball via Srixon’s “Neo Energetic Gradient Growth” technology. Yeah, that’s what I was going to say. The technology varies the core density, producing high ball velocity and high launch angle. In other words, distance. The mid-layer of the ball serves to reduce excess spin off the driver. If the spin is too high, the ball will lose distance as well as accuracy. More simply, straight and long. The 344 dimple outer cover is a soft and very thin cover which helps produce great amounts of spin in shorter clubs. Srixon’s “spin skin” technology helps increase friction between club and ball by 20%, thus helping the player impart more spin in the short game. In other words, control. The XV comes in two colors: pure white and tour yellow. I tested the pure white model. My first experience with the XV model from a couple of years ago was that the ball was too hard for my game and swing speed. I didn’t’ find that I was benefitting from the higher compression and thus not getting the distance. With the new XV I sense some differences in feel and playability for me. In optimal conditions I’m able to play the ball with great results in driver distance. One particular case came on the difficult 468 yard par-4 2nd hole at my home course. Typically my drives end up just inside the 200 yard marker, or roughly 275 yards from the tee. On a nice warm summer day when I was swinging well, I found myself considerably closer to the green at 165 yards. That’s a 30 yard gain. Note however, that those conditions are optimal. By optimal I mean that the temperature was warm, my back was loose and I was swinging very well. I did find that as I got tired (thus my swing speed decreased), the temps dropped or my back tightened up, I didn’t benefit from the ball’s high compression. That makes sense because my top swing speed is probably right around 105. In those optimal conditions when I was fully benefitting I was swinging 105+ and in the not-so optimal conditions I was sub 105 and probably even sub 100. Having just reviewed the Z-Star, I have a good reference point to compare the XV with. I did find for me that I got a touch more spin with the Z-Star versus the XV. And that makes sense, since the XV does rank a bit lower on spin than the regular flavor. That being said, the regular Z-Star has a great amount of spin on short game shots. The XV has plenty. On the durability end of things, both balls in the Z-Star series are extremely durable. The only visible damage I’ve seen on either model in the 100+ holes I’ve played with them was from a cart path. The Srixon Z-Star XV is a great golf ball no doubt. If your swing speed is up high enough, I strongly recommend it. You’ll see massive distance and yet have brilliant short game control. If your swing speed isn’t above 105, go with the regular Z-Star. Nice review is done here..this ball is simply awesome, it maximizes its performance when played by golfers who have a driver swing speed greater than 100 mph.